So, tell me about your blog. If these words strike fear in your heart and cause your brain to bleed, then you need to know how to write an elevator pitch. You suddenly find your brain is empty and your tongue is twisted. Or, have you ever had a (skeptical) friend ask, “What’s your blog about?” in her oh-so-condescending way only to leave you baffled for words? Personally, I have found myself thumbing through the thesaurus in my brain more than once, trying to enunciate what I do but failing miserably. And if I have faltered, then perhaps you have too. You need to write an elevator pitch. A no-fail, memorized explanation of who you are and what you do. Excuse me… do not disregard the fact that as bloggers, we are always selling something. Even if you don’t have a product, you are trying to gain new readers and therefore are selling the concept of your blog. If you do not have a clearly defined target audience, your elevator pitch will be difficult to write. You must know the audience you are trying to attract. And be as specific as possible. Likewise, you need to know your unique value proposition. Perhaps you have never considered what sets you apart from the other bloggers in your niche. Now is the time. Learn more about a Unique Value Proposition in the 8 Characteristics of Successful Bloggers Class. Part of your elevator pitch is gently stating what makes you different from the hundreds of other people writing on your topic and how you use your uniqueness to serve your audience. How you add value to the lives of those who read your blog. Without knowing how you are different and what value you offer, you will struggle to write an elevator pitch. 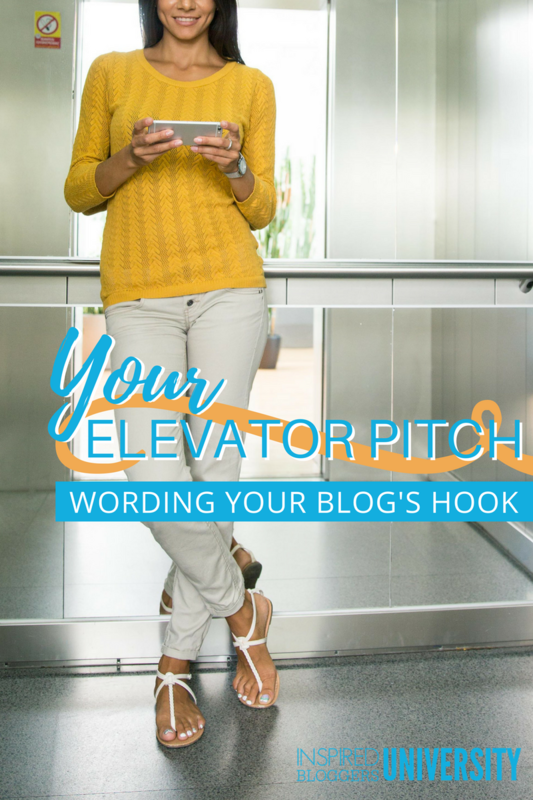 Writing an elevator pitch is not like writing a novel or research paper. Your goal is not to be all-inclusive. 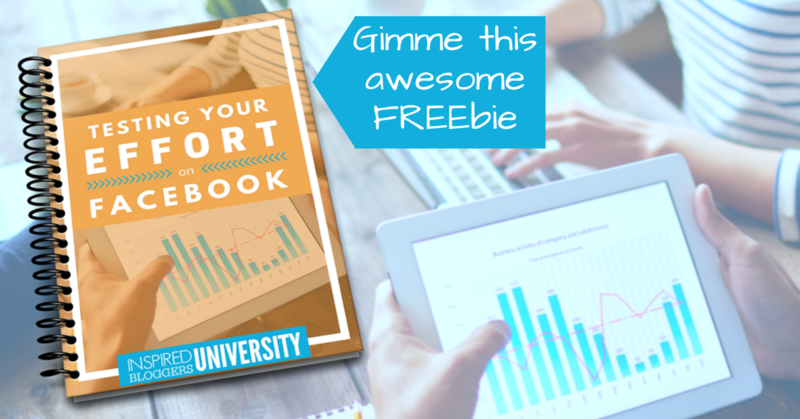 This is not the time to go into a rattling story of how you started blogging or even a synopsis of your most recent blog post. An elevator pitch is short and can be said in 30 to 60 seconds. So, think about 2 sentences or less. When you sit down to write your elevator pitch, think about the flow of information and how it connects. You might find it helpful to think in a progression of Who > Where > What > How. I’m Tabitha Philen, the founder of Inspired Bloggers University. As a professional blogger, I make a full time income from blogging and love teaching others who need to supplement their income to do the same through online courses and live video with an emphasis on personal relationships. Something to note about your “what” is that this is your hook. Your “what” should intrigue them and leave them with questions. But be prepared for the follow-up questions. Personally, I think the call to action is the trickiest part as you often cannot predict what needs to be said. For instance, if you are at a conference of colleagues in a related niche, your CTA could be more relational. If you are talking to someone within your target audience, your CTA would be an offer to assist. Must your elevator pitch follow this same progression? No! Your elevator pitch can be as unique as you are but should include all of these elements. I’m Tabitha and I’m a mom to four kids who has overcome bankruptcy and six-figures in debt through side hustles. I blog at MeetPenny.com to help families like ours raise their kids with common sense on cents by sharing family finance tips, fun kids activities that educate, and how to live a generous lifestyle without a ton of time or money. You can see that what makes me different falls much earlier in my elevator pitch. I was also able to integrate my tagline and the three main topics on my blog. 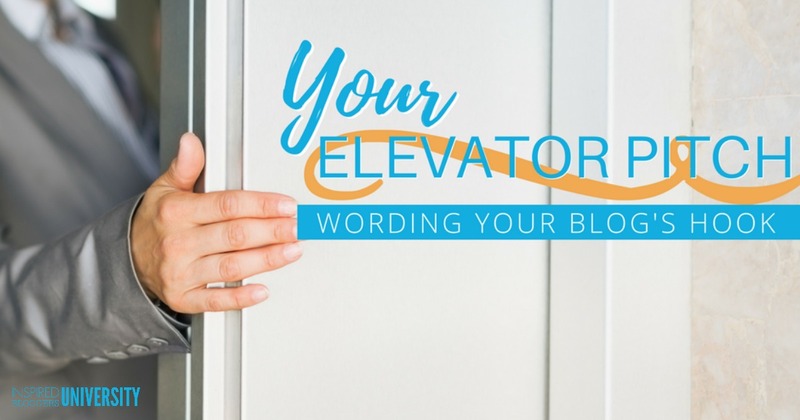 Once you have your elevator pitch written and memorized to the point that it flows naturally, when should you say it? Which situations are prime for using your elevator pitch? When friends or relatives ask you what you do. At conferences when you are networking. As your live video intro. Anytime someone wants to know what you do. Your elevator pitch is a tool that can educate others, create new relationships, and open opportunities with potential sponsors. Commit your elevator pitch to memory and use it often. Need help putting your words on paper? 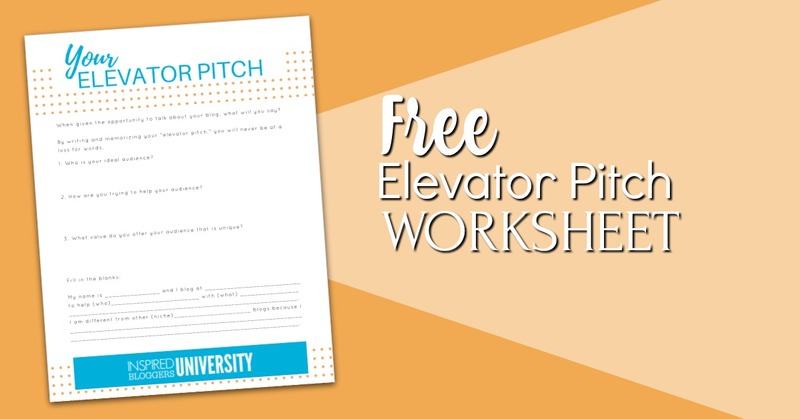 Subscribe and receive this free worksheet that will guide you through each part of your elevator pitch. I even included a fill-in-the-blank template if you are still uncertain. An awesome tips with a video moderator!! I am really in a new blogger user but I think I Have a great experience with blog when I read your article. Thanks ,, hope you carry on for us.